I’m excited that I finally get to post this project. My friend, Kristy, reads my blog, so I couldn’t spoil the surprise. I had the quilt done before Christmas, but I didn’t get to deliver it until earlier this week because I got sick and had to cancel meeting my friend’s new baby. Friends don’t give other friend’s colicky babies illness if it can be helped. Kristy is a special friend of mine. We used to cry together over boys and dream together about the future and encourage each other spiritually. Come to think of it, we still encourage each other spiritually, and she’s continued to let me cry about boys. It’s one of those friendships where we only see each other a couple times a year due to distance, but we can pick up the phone and pick up right where we left off. I remember riding a train to NYC with her as she was just starting a relationship with the man who would become her husband. She was giddy as she got his text messages with a Bible verse of the day, and now Kristy has moved on to a new phase in life as a beautiful mom, so a quilt seemed like a good way to celebrate. The last quilting project I finished was a table runner that I think I may have started in high school or early on in college and didn’t finish until after grad school. I wanted to get this quilt ready before Adam’s graduation, so I had to machine quilt for the first time instead of doing everything by hand, though I did still do the applique by hand. The quilt itself took a small village to make. My friend Danielle helped me pick the fabrics. Then, my Pinterest group helped me figure out that I needed to swap the polka dot pattern that is in the border and on the back of the quilt with the light green fabric (that was originally supposed to be the back of the quilt). I was having a mini meltdown because the letters wouldn’t show up on the busy larger polka dots, but the girls at Pinterest night helped me trouble shoot until the colors were just right. Jennifer, one of my friends in the area, graciously helped me get the quilt sandwiched together and let me use her Cadillac of a sewing machine for my first experience in machine quilting. Then, another friend, Brock, searched all over his house to find good lighting to get a picture of the finished quilt after dark in the dead of winter. Thanks guys! 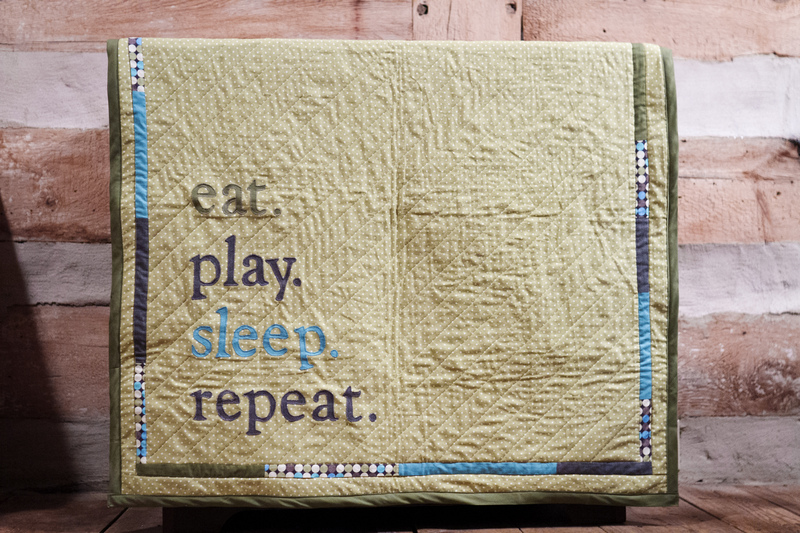 If you’re a quilter feeling inspired, you can check out the free pattern and detailed tutorial for this Baby Life quilt on the Moda Bake Shop blog. Don’t forget to iron your letters onto the wrong side of the fabric. The tutorial does a good job of pointing that out, but I still messed it up a time or two, so I figured I would pass along the reminder. If you’re looking for some other inspiration for this pattern, you could check out two beautiful variations at Hooked on Needles (fun alternative word placement) and Sew Sane Jane (her polka dot fabric is too much fun!). This entry was posted in Pinterest, quilting and tagged quilt. Bookmark the permalink. That is such a sweet looking quilt! I love the colors you chose. Thank you! It took some arranging and rearranging and tossing out some of the colors that I thought I would use, but it was worth it in the end.